yzf600, the speed/power/frequency settings on my Epilog 45W are 6/100/5000, which I think is pretty standard for cutting 1/4″ acrylic on a 45W. I then manually focus the laser just a little into the material, but I’m not sure if that matters, what I’m really trying to do is minimize the taper of the cut from the conical laser beam. I was worried about that too. But since it’s exactly straight up-n-down (instead of at a slant, like the normal dock), the stress seems to be lessened. 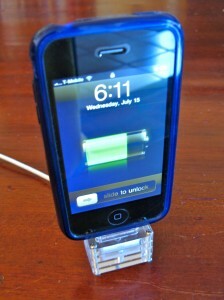 Nice idea but without any support it’s going to put a lot of stress on the dock plug and socket. What speed and power did you use? I guess I’ll need your model/wattage number as well to try to reproduce your results. Yup, Epilog. And pretty much all the lasers will give you those grooves. This piece has that also, but it’s not that visible. By boosting the power or slowing the speed, you can reduce the visibility of the grooves at the expense of the accuracy of the cuts. This is because you’re pumping more heat into the material so it melts and reflows a little. Did you use an Epilog laser? A colleague of mine has done a fair amount of acrylic cutting, but the edges always come out with little grooves on them. We were just wondering how you got your cuts so soooth.